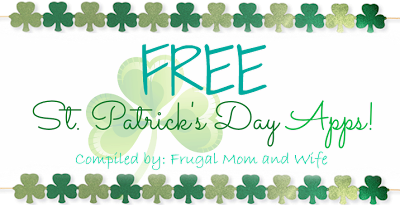 Frugal Mom and Wife: FREE St. Patrick's Day Apps List! FREE St. Patrick's Day Apps List! March is here and along with it comes getting in the St. Patrick's Day groove. Below you will find 10 Free apps to help you celebrate by getting you in the shamrock spirit. Clover Catch - St Patricks Day Fun! Like this? Check out my St. Patrick's Day Pinterest Board! Follow Frugal Mom and Wife's board St. Patrick's Day on Pinterest.